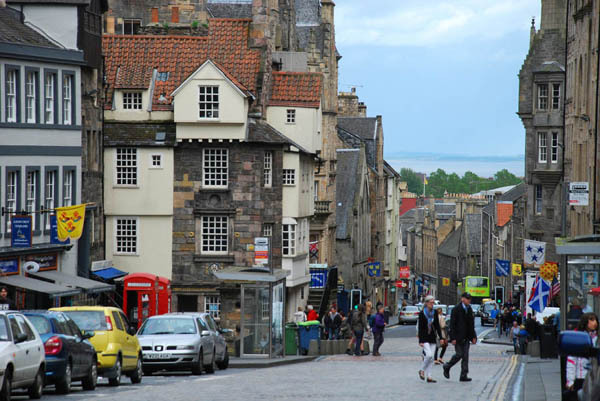 The Royal Mile leads down hill from the castle hill to Holyrood, which was once an abbey. Tradesmen were given plots of land on either side of the lane. Edinburgh! This city should have an exclamation point after its name on town signs, maps and so on. It’s that great of a city. Scotland’s capital and second largest city after Glasgow, the city attracts more than a million visitors per year, making it second only to London as far as popularity in the United Kingdom. It’s no secret – this city is a winner all around. Holyrood Castle with its ancient abbey ruins. 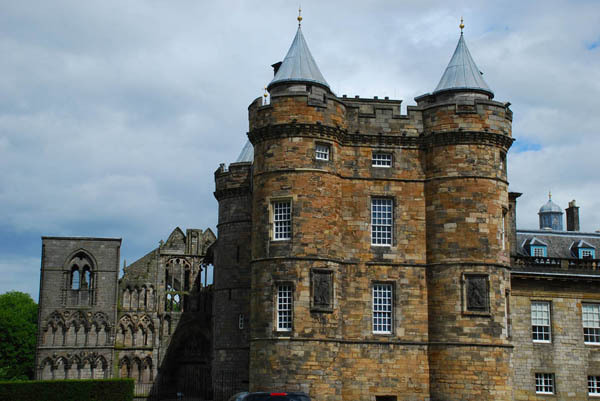 The Queen of England spends time here on her frequent visits to Scotland. We discovered the castle, which has been a fortress since at least the 6th century. It was in a plain bedroom here that Mary Queen of Scots gave birth to a boy who would become both king of Scotland (James VI) and England (James I) after the death of Queen Elizabeth I. Every English monarch since traces their roots to that birth in Edinburgh castle. And it is in Edinburgh castle that the oldest crown jewels in Europe can be seen, and without the horrible lines one experiences at the Tower of London. The jewels in London were created after Cromwell destroyed the originals in the 1600s. Scotland’s royal jewels are several hundreds of years older, and we think, more interesting. 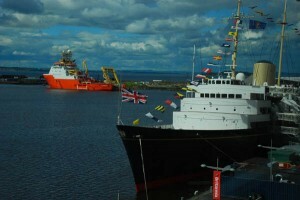 The HMS Britannia is docked at Edinburgh. The ship was the Royal Family's getaway and diplomatic vessal until Tony Blair's government forced its decommissioning in 1997 due to high costs of running the ship. One of the best ways to get a feel for a large city is to take an open-top bus tour. That’s what we did on our first morning in Edinburgh. A witty guide led us around the city as the sun played dodge-em with the low clouds which seem to be a permanent fixture over Scotland. Edinburgh’s historic center, with more than 450 listed buildings, is surprisingly compact and ignoring the terrible scar of construction through its heart (the result of a botched streetcar project which has cost three times what was projected and which is more than four years behind schedule) is pretty easily navigated. The “new” town, a fine section of Georgian buildings constructed in the 18th century, is laid out in a neat grid pattern. The medieval town is, other than the relatively straight “Royal Mile” leading from the castle to the castle of Holyrood (where the Queen chills out on her visits to Edinburgh) is a warren of narrow lanes and miniature squares under towering apartment blocks built in the 14th and 15th centuries to house Edinburgh’s exploding population. What were once squalid apartment houses are now chic apartments with shops in their lower levels. 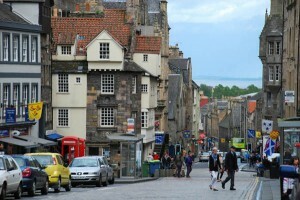 The Royal Mile is where you’ll find most of the tourists. It’s where you found us on a rainy then sunny then rainy again day, wandering, looking, taking pictures and enjoying much of what this amazing city has to offer. We can’t wait to go back. Carlton and Linda Crenshaw in two old phone booths at Edinburgh Castle. As cell phones take over, these iconic symbols are becoming a rare sight. 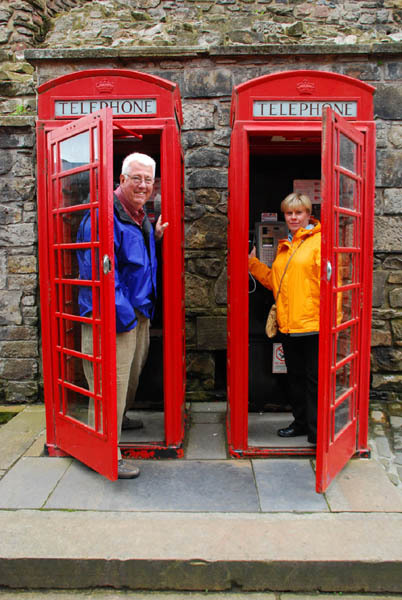 Posted in Europe Tours, Private Tours in Europe, Scotland Tours and tagged edinburgh, europe, family, group, in, mile, of, private, royal, scotland, small, to, tour, touring, tours.